Margot Miller, In Search of Shelter: Subjectivity and Spaces of Loss in the Fiction of Paule Constant, Lexington Books, 2003, 190 p.
The fiction of French post-colonial writer Paule Constant is remarkable in its lurid and disturbing portrayals of female characters suffering in profoundly oppressive "colonizing" circumstances. 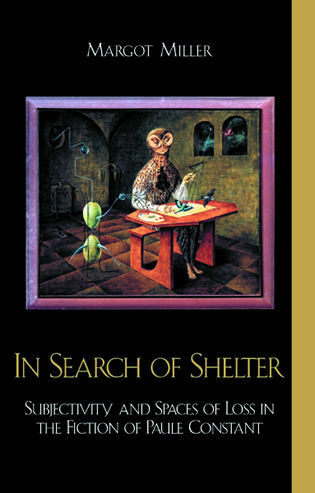 In In Search of Shelter: Subjectivity and Spaces of Loss in the Fiction of Paule Constant, author Margot Miller skillfully synthesizes Karen Horney's model of submission, aggression and withdrawal, Jean Baker Miller's concept of relational being, Julia Kristeva's idea of psychic space, and Kelly Oliver's notions on social support to analyze Constant's work. Miller's close reading also brings to light previously unnoticed mythological references in Constant's fiction which illuminate the characters' psychological realities, and examines Constant's nuanced treatment of violence through language. In Search of Shelter: Subjectivity and Spaces of Loss in the Fiction of Paule Constant reveals the myriad intersections of interpersonal and cognitive psychology, mythological and cultural awareness, literature, and lived experience, and suggests new ways of reading these and other works of fiction.